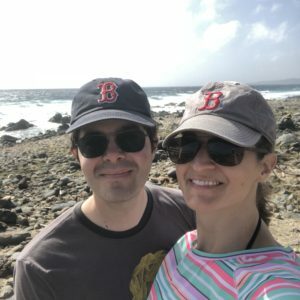 We just returned to Boston from our Aruba honeymoon (ok, we returned a month ago–sorry!). Life has been super busy lately, so I am trying to catch up on a bunch of posts, so there will be lots of new posts coming your way soon! When we were planning our honeymoon, we were also trying to pay for our wedding and facing the prospect of replacing our heating system, which can be really expensive to replace in our case. So Ken told me he wanted to spend $1,000 on our honeymoon. Total. Not per person. Challenged accepted, boo. 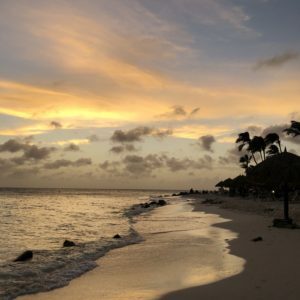 I used our Southwest Companion pass and points to fly down to Aruba for just the price of taxes, about $75 per person. Then we stayed at my mom’s timeshare trade (one of the Divi Resort Aruba – Divi Village Golf & Beach Resort), which ended up being about $400. We spent one night at the Renaissance Aruba hotel for about $200. So those core costs did get us pretty close to the $1,000 goal, although once you add in the price of food, day trips, and taxis, we probably ended up spending about $1,600 on the honeymoon. Still not bad, though! 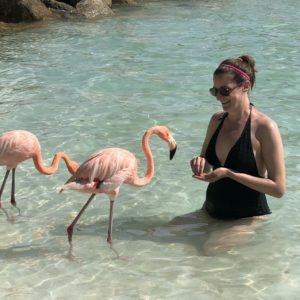 I wanted to share some of my favorite experiences during our Aruba honeymoon. Enjoy! This article contains affiliate links, which means we might make a small commission if you end up purchasing an item I recommend at no cost to you. We took the full day Island Ultimate tour, which was about 8 or 9 hours packed with sightseeing and special experiences. We started in the morning with pickup at our hotel and proceeded to the ABC Tour office to sign waivers, then we were off! 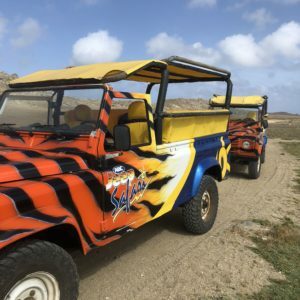 The tour stopped by the lighthouse before off-roading down to the coast to check out a natural stone wall, rocky coastline, and a gold-mining outpost. After lunch, we headed to the Natural Pool, a big stone pool protected from the ocean. It was so cool swimming in the Natural Pool and watching waves break over the stones! We then headed to snorkel at Baby Beach, one of the prettiest beaches in Aruba. We saw great fish there, and I saw one big guy who must have weighed 100 lbs! 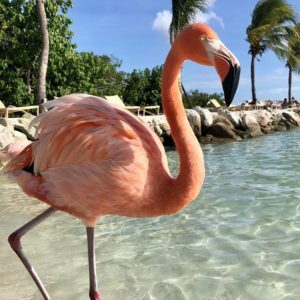 I was obsessed with Renaissance Island and its flamingos, and we visited it twice during our Aruba honeymoon! If you’re not staying at the Renaissance hotel, day passes to the private island cost $100 per person. However, a room at the hotel was only just over $200, so it made so much more sense to book one night at the hotel and enjoy the island for two days (the day we checked in and the day we checked out).You get to Renaissance Island by a private speedboat owned by the hotel.When you arrive, you’re greeted by pelicans, lizards, and birds. Adults can head off to the right towards the adult-only area, which is where the flamingos are. Families can head off to the left side of the island where the restaurant is located, along with a second beach area.We loved watching people take pictures with the flamingos, and snapped several ourselves! The second day, we got there early and had breakfast at the on-island restaurant. The breakfast was so huge it filled us up for most of the day! Pro tips: get to the island early to grab chairs under the umbrellas. Shade is scarce on the island! And for the best flamingo pictures, stay until the very end of the day when there are less tourists. We spent a beautiful day at sea with the Champagne and Lunch Snorkel Cruise that I booked on Viator. The morning kicked off with high energy music, croissants, champagne, mimosas, and fruit as we headed towards our snorkel sites. We stopped off at three separate sites to view so many amazing colorful fish! I think this ranks as one of my favorite snorkel trips we’ve done. The reefs were healthy and the fish were vibrant and colorful. Our trip included lunch and an open bar, and the crew was top notch! Aruba had the most beautiful sunsets I’ve ever seen. Deep oranges, reds, and purples brushed the sky every night! Super romantic to view during an Aruba honeymoon for sure. Stroll along the beach at sunset and enjoy! Luckily our hotel had a small kitchenette, so we prepared many of our meals in the room before exploring the island. However, we did have a few amazing meals that really stood out! Windows on Aruba brunch was outstanding! The Divi Golf Hotel (part of the Divi Resort Aruba family) was where we stayed, and they have a superb restaurant on the property. 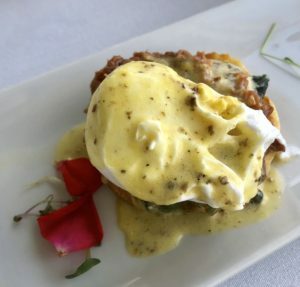 The Sunday brunch has been ranked as the best on the island, and I agree! It is a flat price per person (I think about $40 per person), and you can order unlimited mimosas and small plates off the menu. 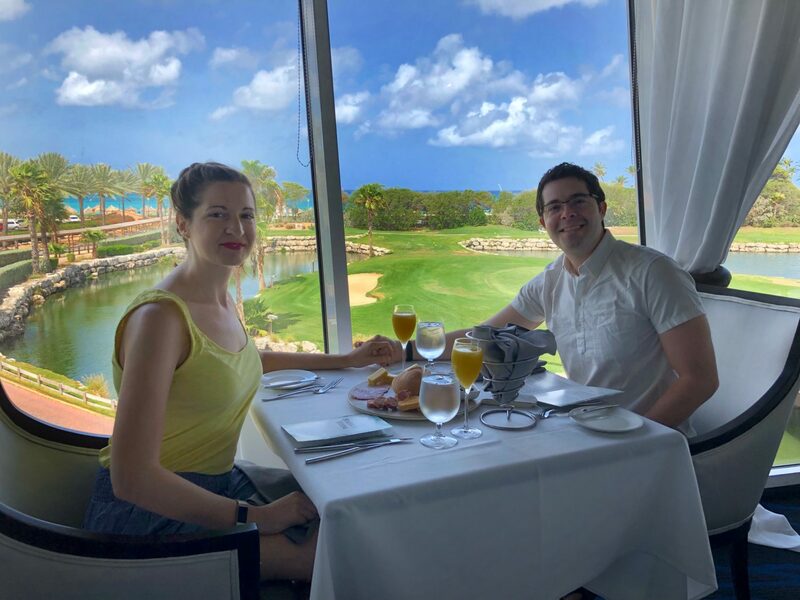 Since we had arrived the day before, this brunch was the perfect way to begin our Aruba honeymoon with a bang! We tried so many of the options on the menu like french toast, pancakes, Eggs Benedict, and scallops. There was a guitarist playing throughout the brunch, which was a lovely addition to the meal. A local taxi driver recommended Yemanja Woodfire Grill to us, and we decided to try it out on our last night on the island. We sat at the bar and ordered steak and a salad. Both meals were flavorful and fresh, and we loved watching the kitchen prep all of the meals through the glass. 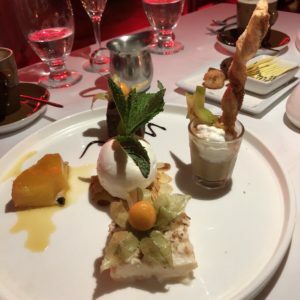 They had a robust wine menu, and the restaurant had a relaxed and friendly vibe that we enjoyed. The first was the Divi Resort Aruba Golf Club and the second was the Marriott Renaissance Aruba. Overall, we enjoyed the Renaissance Aruba a lot more. The staff was so friendly and the hotel itself was gorgeous. Plus you have access to the private island! If you have Marriott points you can use them at the Renaissance. 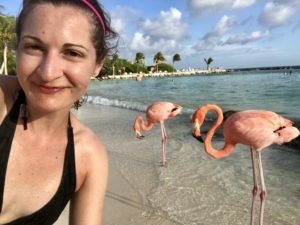 I’m not here to tell you how to dress or what to pack for your every day comfort, but there are a few items you definitely don’t want to forget during your Aruba honeymoon! Alba sunscreen; it goes on smooth and the white-ness rubs in quickly. It’s biodegradable, so you can feel good wearing it in the water. It comes in a variety of SPF and scents like green tea, tropical fruit, or fragrance-free. Biodegradable Shampoo and Conditioner will be gentle on local water systems. I like these from The Honest Company. And check out my guide on biodegradable shampoos and soaps! Check out this Repel with Deet version if you’re not messing around or this more natural option using essential oils by Mosquito Guard. These water shoes from Aleader are breathable, have a sturdy base, and come in a bunch of cute colors like teal, peach, or lavender. Many of the beaches are rocky and these will come in handy! I love these trekking shoes by Keen. They’re really like a sandal and sneaker in one. They’re sturdy but also dry fast. Aruba has pure and fresh drinking water, so ditch the one use bottles and bring your own! This Kemier bottle folds up, so it saves you space when you’re not using it. It’s also made of medical grade silicone that’s BPA free. Whether it’s a baseball cap or one that has a rim all the way around, you’ll definitely need a hat to keep your face out of the sun. I snagged one of these wide rim Columbia hats before my trip to protect my face and ears. You’ll need a shirt with SPF built in to protect you on long day trips in the sun or hanging on the beach. These sun shirts from Vapor come with UPF 50+ and come in a wide variety of colors. 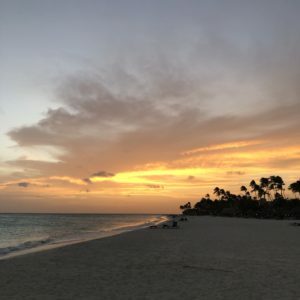 I hope this short guide will help you plan your Aruba honeymoon! 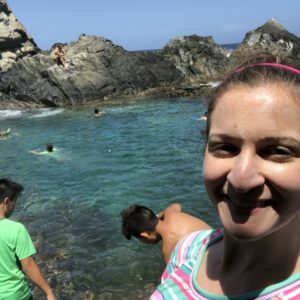 We had such a wonderful time and I wanted to share a few ideas of how to spend the beautiful, sunny days! 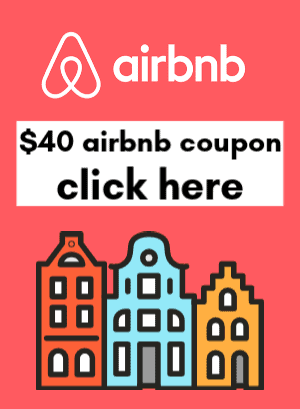 If you have been to Aruba or are planning on going soon, comment below!